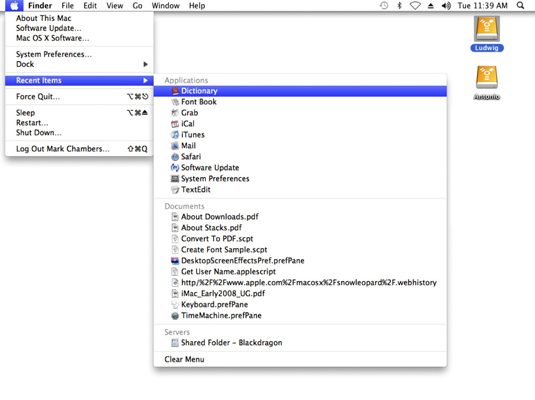 Mac OS X Snow Leopard offers the Recent Items menu to save you the trouble of drilling for applications and files (and even network servers). The Recent Items menu is divided into Applications, Documents, and Servers. When you open documents or launch applications, they’re added to the list. To launch an application or document from the Recent Items menu — or connect to a network server — just click it. Use the Recent Items menu to access files, applications, and servers you’ve been using. To clear out the contents of the Recent Items menu — for example, if you’ve just finished a project and want to turn over a new digital leaf — click Recent Items and choose the Clear Menu item. You can specify the number of recent items that will appear in the menu from System Preferences; display the Appearance pane and click the Applications, Documents, and Servers list boxes in the Number of Recent Items field.